"We go round the house and round the house, but rarely go into the House of Mind; we offer mental gymnastics, but these do not take the place of food, and of that we serve the most meagre rations, no more than that bean a day! Diet for the body is abundantly considered, but no one pauses to say, "I wonder does the mind need food, too, and regular meals, and what is its proper diet?" Now we'll read her answer: "I have asked myself this question and have laboured for fifty years to find the answer, and am anxious to impart what I think I know, but the answer cannot be given in the form of 'Do' this and that, but rather as an invitation to 'Consider' this and that; action follows when we have thought." No do this or that, but principles to consider, thoughts to think and ponder- and the practice will follow from carefully thinking through the principles. "The life of the mind is sustained upon ideas; there is no intellectual vitality in the mind to which ideas are not presented several times, say, every day. But [we may ask] scientific experiments, natural beauty, nature study, rhythmic movements, sensory exercises, are all fertile in ideas? Quite commonly, they are so, as regards ideas of invention and discovery; and even in ideas of art; but for the moment it may be well to consider the ideas that influence life, that is, character and conduct; these, would seem, pass directly from mind to mind, and are neither helped nor hindered by educational outworks." So we want our children's minds to feast upon these ideas that influence the character and conduct of our lives. Where shall we find this mind-food? "Every child gets many of these ideas by word of mouth, by way of family traditions, proverbial philosophy,––in fact, by what we might call a kind of oral literature. But, when we compare the mind with the body, we perceive that three 'square' meals a day are generally necessary to health, and that a casual diet of ideas is poor and meagre. Our schools turn out a good many clever young persons, wanting in nothing but initiative, the power of reflection and the sort of moral imagination that enables you to 'put yourself in his place.' "
"These qualities flourish upon a proper diet; and this is not afforded by the ordinary school book, or, in sufficient quantity by the ordinary lesson. I should like to emphasize quantity, which is as important for the mind as the body; both require their 'square meals.' It is no easy matter to give its proper sustenance to the mind; hard things are said of children, that they have 'no brains,' 'a low order of intellect,' and so on; many of us are able to vouch for the fine intelligence by children who are fed with the proper mind-stuff; but teachers do not usually take the trouble to find out what this is. We come dangerously near to what Plato condemns as "that lie of the soul," that corruption of the highest truth, of which Protagoras is guilty in the saying that, "Knowledge is sensation." Wait, who does she quote here? PLATO? But I was told.... oh, never mind. I won't be snarky any more. "What else are we saying when we run after educational methods which are purely sensory? Knowledge is not sensation, nor is it to be derived through sensation; we feed upon the thoughts of other minds; and thought applied to thought generates thought and we become more thoughtful. No one need invite us to reason, compare, imagine; the mind, like the body, digests its proper food, and it must have the labour of digestion or it ceases to function. But the children ask for bread and we give them a stone; we give information about objects and events which mind does not attempt to digest but casts out bodily (upon an examination paper?). But let information hang upon a principle, be inspired by an idea, and it is taken with avidity and used in making whatsoever in the spiritual nature stands for tissue in the physical." "Education," said Lord Haldane, some time ago, "is a matter of the spirit,"––no wiser word has been said on the subject, and yet we persist in applying education from without as a bodily activity or emollient. We begin to see light. No one knoweth the things of a man but the spirit of a man which is in him; therefore, there is no education but self-education, and as soon as a young child begins his education he does so as a student." Information vs ideas, thoughts, principles. And what are we do to in this? "Our business is to give him mind-stuff, and both quality and quantity are essential. Naturally, each of us possesses this mind-stuff only in limited measure, but we know where to procure it; for the best thought the world possesses is stored in books; we must open books to children, the best books; our own concern is abundant provision and orderly serving. I am jealous for the children; every modern educational movement tends to belittle them intellectually; and none more so than a late ingenious attempt to feed normal children with the pap-meat which may (?) be good for the mentally sick: [This may refer to Montessori, who built her approach based on her experiences working with mentally ill children. 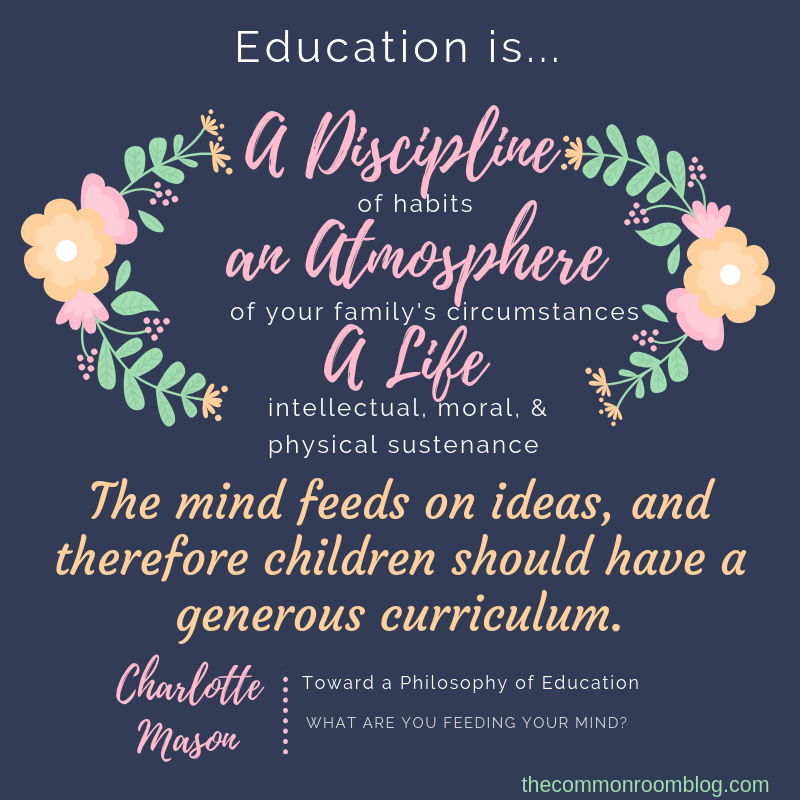 Charlotte Mason was so alarmed at the way Montessori's ideas were sweeping the educational world, that she wrote a letter to the editor of the newspaper, which you can read about here.] but, "To all wildly popular things comes suddenly and inexorably death, without hope of resurrection." If Mr. Bernard Shaw is right, I need not discuss a certain popular form of 'New Education.' It has been ably said that education should profit by the divorce which is now in progress from psychology on the one hand and sociology on the other; but what if education should use her recovered liberty make a monstrous alliance with pathology?" Mason is definitely speaking of Montesorri here, but there are still greater principles for us to keep in mind. The alliance with pathology here is likely a reference to the fact that Montesorri's method wer born out of her initial work with disabled children who were institutionalized, and thus needed some more basic approach to begin with. Be careful that our cherished tricks and tips, too, do not come from a pathological view of children and education, but from a whole, sane, and sound foundation. "Various considerations urge upon me a rather distasteful task. It is time I showed my hand and gave some account of work, the principles and practices of which should, I think, be of general use. Like those lepers who feasted at the gates of a famished city, I begin to take shame to myself! I have attempted to unfold (in various volumes [Home Education Series.]) a system of educational theory which seems to me able to meet any rational demand, even that severest criterion set up by Plato; it is able to "run the gauntlet of objections, and is ready to disprove them, not by appeals to opinion, but to absolute truth." Some of it is new, much of it is old. Like the quality of mercy, it is not strained; certainly it is twice blessed, it blesses him that gives and him that takes,* and a sort of radiancy of look distinguishes both scholar and teacher engaged in this manner of education; but there are no startling results to challenge attention. [*Portia, from The Merchant of Venice, Act IV, Scene I] Professor Bompas Smith remarked in an inaugural address at the University of Manchester that,––"If we can guide our practice by the light of a comprehensive theory we shall widen our experience by attempting tasks which would not otherwise have occurred to us." It is possible to offer the light of such a comprehensive theory, and the result is precisely what the Professor indicates,––a large number of teachers attempt tasks which would not otherwise have occurred to them. One discovers a thing because it is there, and no sane person takes credit to himself for such discovery. On the contrary, he recognizes with King Arthur,––"These jewels, whereupon I chanced Divinely, are for public use." "For many years we have had access to a sort of Aladdin's cave which I long to throw open 'for public use.' Let me try to indicate some of the advantages of the theory I am urging––It fits all ages, even the seven ages of man! It satisfies brilliant children and discovers intelligence in the dull. It secures attention, interest, concentration, without effort on the part of teacher or taught. Children, I think, all children, so taught express themselves in forcible and fluent English and use a copious vocabulary. An unusual degree of nervous stability is attained; also, intellectual occupation seems to make for chastity in thought and life. Parents become interested in the schoolroom work, and find their children 'delightful companions.' Children shew delight in books (other than story books) and manifest a genuine love of knowledge. Teachers are relieved from much of the labour of corrections. Children taught according to this method do exceptionally well at any school. It is unnecessary to stimulate these young scholars by marks, prizes, etc. After all, it is not a quack medicine I am writing about, though the reader might think so, and there is no IS. I 1/2d. a bottle in question! Over thirty years ago I published a volume about the home education of children and people wrote asking how those counsels of perfection could be carried out with the aid of the private governess as she then existed; it occurred to me that a series of curricula might be devised embodying sound principles and securing that children should be in a position of less dependence on their teacher than they then were; in other words, that their education should be largely self-education. A sort of correspondence school was set up, the motto of which,––"I am, I can, I ought, I will," has had much effect in throwing children upon the possibilities, capabilities, duties and determining power belonging to them as persons. "Children are born persons," is the first article of the educational credo in question. The response made by children (ranging in age from six to eighteen) astonished me; though they only shewed the power of attention, the avidity for knowledge, the clearness of thought, the nice discrimination in books, and the ability to deal with many subjects, for which I had given them credit in advance. I need not repeat what I have urged elsewhere on the subject of 'Knowledge' and will only add that anyone may apply a test; let him read to a child of any age from six to ten an account of an incident, graphically and tersely told, and the child will relate what he has heard point by point, though not word for word, and will add delightful original touches; what is more, he will relate the passage months later because he has visualised the scene and appropriated that bit of knowledge. A rhetorical passage, written in 'journalese,' makes no impression on him; if a passage be read more than once, he may become letter-perfect, but the spirit, the individuality has gone out of the exercise. An older boy or girl will read one of Bacon's Essays, say, or a passage from De Quincey, and will write or tell it forcibly and with some style, either at the moment or months later. We know how Fox recited a whole pamphlet of Burke's at a College supper though he had probably read it no more than once. Here on the very surface is the key to that attention, interest, literary style, wide vocabulary, love of books and readiness in speaking, which we all feel should belong to an education that is only begun at school and continued throughout life; these are the things that we all desire, and how to obtain them is some part of the open secret I am labouring to disclose 'for public use.'" This is exciting stuff. I get wriggly and happy every time I read it. Think of all this delicious knowledge, the Aladdin's cave she is describing. We want this for you and your families! Challenges- This time, just for fun, I'm suggesting some points for each challenge and you add them up. Reading- Charlotte Mason is a literature based curriculum. There is no way to really get through this and do it well if we don't read. 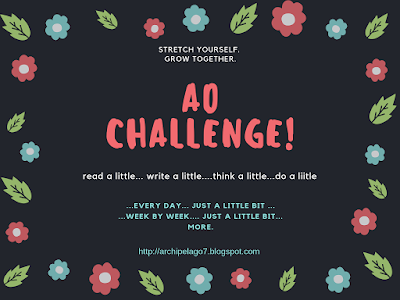 It's okay to begin even if you aren't much of a reader, but to be honest, it's not going to be at all easy to continue if we don't work on this. We cannot start any sooner than now, and we cannot work on this any better way than to read a little bit every day, steadily, consistently, over time, little by little, line upon line, precept by precept. Read and then narrate the above post. 5 points, 10 if you leave a comment with your narration. Pick some mom-culture to read- it can be a Parents' Review article, something from one of Miss Mason's books, a book in the curriculum schedule or anything else. Assign yourself a set number of pages to read a day and work toward that goal. 2 points for every day you meet your goal. 5 points if you meet your goal for the week (whether or not you met your goal each day). You need to aim for reading some of it every day, advancing week by week. Do this, and when you finish the book and choose the next one, I guarantee that you will find the next book easier than the one before. And after that you will find the next book just a little bit easier than the one before. And one day soon you will re-read that first book for pleasure and be surprised at how easy it is for you! It needs to be more complex than what you normally read, but just challenging enough- not incomprehensible. 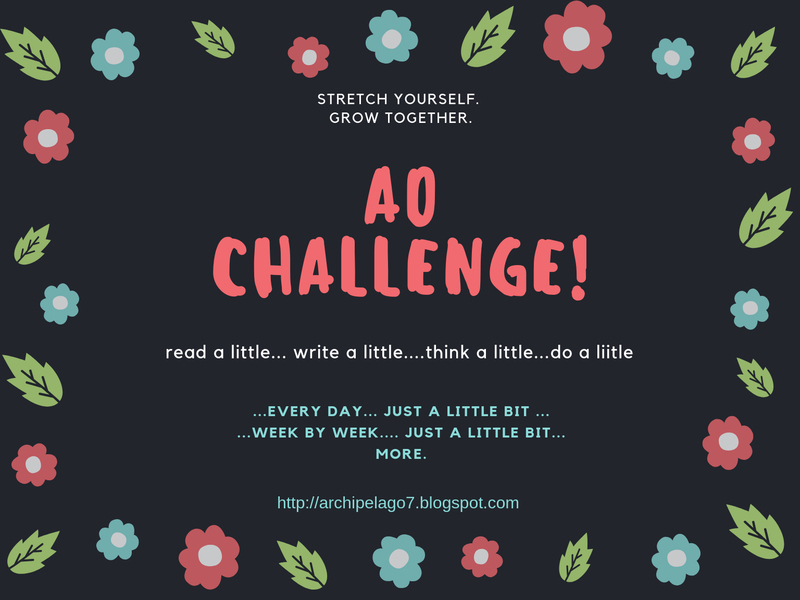 AO Forum- Why? Because the most thoughtful, in depth, parent to parent discussions are found here in the forum and we care a lot more about your privacy than Facebook does. Also, we have a teen discussion area, and if you have a teen, they just might love the chance to chat with other teens reading the kinds of books they are reading. If you want to post anything at all, go to the general Q and A section- click here: https://amblesideonline.org/forum/forumdisplay.php?fid=9 look for Post Thread (over to the right beneath the welcome area). ten points for posting! Mason wrote a pamphlet introducing her methods to those who were unfamiliar with them. Karen Glass would love it if you would read that pamphlet and answer a couple questions for her (feel free to comment to this post). In your opinion, can you read it today and feel like you have a better understanding of the answer to the question "what is a CM education?" Would we be justified in suggesting to people in the future, "reading this will give you a good overview of CM's ideas and philosophy?" 20 points for reading. Ten points for answering one of these two questions. Plutarch- You are invited to come join us for a Plutarch book discussion on the AmblesideOnline Forum in the Book Discussion area of the Forum. ETA: We will be starting Demosthenes on Monday, Oct 8, as he is this term's life. If that seems too quick, please plan to join us on Nov 12 when we start Cicero. 10 points for joining. 15 points for joining, reading, and commenting. Sing every day. Try a folk song to wrap up a math lesson or when transitioning from foreign language to the next topic. Every day! If you use the youtube videos to learn the songs, remember that the kids do not have to see the video- they are to be listening and singing along, not watching. Print the lyrics, hand each reader a copy, and sing along together, weaning yourselves from the accompaniment as soon as possible. 1 point each school day (M-F) you sing a folk song. Hymns: http://amblesideonline.org/Hymns.shtml Follow our line-up, print out or write out a copy of this term's hymn(s), listen to it on youtube while trying to sing along. Once you have a good idea of the hymn tune, turn off the computer and sing. This should take maybe five or ten minutes at most. Try taping copies of the hymn lyrics to your kitchen wall near the sink or stove, on the refrigerator, in the bathroom on a door or near the mirror, over the bed, on the kitchen table under some plastic protective covering- any flat surface convenient to you, so you can easily sing out your new hymn at other times. Hymn singing is a great transitional activity after Bible or science studies. 2 points for each day (M-F) you sing a hymn. Children of the Open Air: Sol-Fa Subscribe to Heather Bunting's Children of the Open Air youtube channel. Pick a tutorial and watch it a couple of times this week. 5 points for watching once, an additional point for each additional watch. Most of us know that we tell mammals from birds by certain characteristics- fur or hair vs feathers, live births vs eggs, nursing young, etc Plants are also identified by sorting out a few basic characteristics, which sounds a bit daunting, but once you get started, it's not as difficult as you imagined. It's a matter of pattern recognition, and God wired our brains for pattern recognition. It's just that most of us never got past "what colour are the flowers?" so it's unfamiliar. The unfamiliar always sounds scarier than it is, so we're working on making it familiar. The colour of the flowers is the most visible, but it's not the most important thing to know in order to learn to identify plants. In order to develop our plant I.D. skills, we first need to notice some other plant characteristics. In these challenges, I've been asking our players to notice some of these other important characteristics. Things you need to notice include characteristics such as the shape of the leaves, the way the leaves grow on the stems, the shape of the stems (all plants in the mint family have a basically square shaped stem), the number of petals on a flower (all mustard family members have four petals and six stamens, 4 tall and 2 short) and the edges, or 'margins', of the leaves. 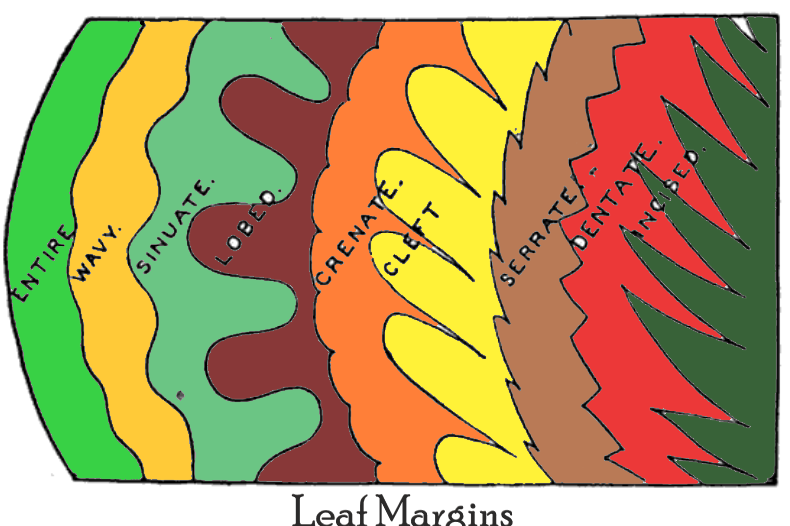 Identify smoothe, wavy, and lobed leaves in your area. If you do not live in the tropics, add toothed or serrated to your identification. 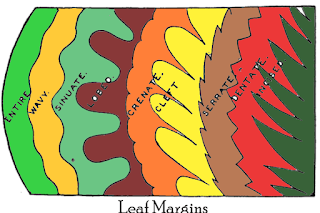 To aid in this pattern recognition, above you'll see a handy chart of leaf margins- or edges. Look at the edges of the leaves of the plants, trees, shrubs, weeds available to you first hand. Look at a few plants in your yard, neighborhood, local park, plant nursery, or visit an arboretum. See if you can identify how the edges of the leaves would be described. Find a leave with smoothe or 'entire' margins. Find a lobed leaf. Look for a wavy or sinuate leaf. This is not much more complicated than learning the difference between a triangle and a rhombus and you did that once, so know that you can do this, too. We believe in you! However, nothing at all will help like getting outside to look at an actual tree and the real leaves on real plants. That is far more important at this stage then memorizing terms. Interesting sidenote: If you live in the tropics, you probably won't see many serrated edged leaves. In a year and a half of living in the Philippines and looking at trees and other plants several times a week, often some of the same trees at least once a week for the last year- I have not noticed that, but now that I think about it, it's true! See what you notice outside near your own home (Hint: If it's very hot, do this in the morning or evening, bring out a chair and a fan and a dishpan of cold water. Gather leaves, sit in the shade (use an umbrella if you need to bring your own shade, have the fan blowing and your feet in the dishpan of cold water and sort your leaves by their margins. Five points for each day you go outside. Ten points for identifying a new plant, insect, or bird, 5 points for trying but failing. One point each for each category of leaf you find. Ten points for drawing in a nature journal. 120 or more points: You are a SKYLARK! Keep on soaring and singing. 100-119 points- You are an adorable baby skylark chick. Keep on growing! 75 to 99 points- You are a beautiful, shining, precious egg. Stay warm, safe, and nourished. You'll hatch soon if you just continue with what you are doing. 40 to 74 points- You've got a great nest started! You can work on the egg next. Keep on building and growing. You can do it!! 19-39 points- In the hole, there was a tree, the prettiest tree you ever did see, and the tree was in a hole, the hold was in the ground, and the green grass grew all around all around, and the green grass grew all around! That's a habitat, an environment you've been creating, and it's a good start. You can't have the bird without the tree and the green grass and grubs for the bird to eat, so this is a great start. Just keep going from where you are now. 1 to 18 points- You've got the green grass, and the hole, and now it's time to work on that tree! 0 points- We love you. Seriously. As I typed this I've prayed- let this not be a discouragement, but rather, a bit of laugher, a cheering up, a warm helping hand, and for those who have had those rough horrible weeks (or years) that I, too, have experienced, Lord, love them, lift them, nourish them and let them feel and know your love and infinite compassion. Healing, Lord, I beg of you, healing of lacerated spirits and souls, worn down and worn out with seriously hard things, with medical diagnoses that turn the knees to jello and the bones to zero at the bone, with hardship and heart-ache of every kind, whether it be relationships, sickness, sadness, poverty, disaster or all the other painful realities of this world. What matters most is, of course, your relationships- first and foremost with your creator, then with your family and those around you. God bless you and yours in those most important fields. This little quiz does not define anybody, of course. It's just meant to be a fun little exercise to help with the challenges. Even within that narrow restriction, what matters most is not racking up all the points, but considering whether or not you would have more points this week than previous weeks or months if you awarded yourself points in the same way? What would the trend look like if you made a graph? Are you reading a bit more than you were six months ago? Is the reading you do now more challenging than the reading you did six months ago? Are you singing more? Are your children singing? Do you know a plant in your area that you did not know last year or last month? And how much do you care? Keep on working and growing with us, feeding your mind regular servings of nourishing food, and a wide variety!